to our Online Press Center for media and journalists with our latest press releases and downloads. Content and material may be processed and altered, as long as its clear recognition is guaranteed and no changes are made to the content that might possibly result in a meaning other than that originally intended. The content may not be used in a form that distorts its meaning and alienation of the material is not permitted. This does not apply for separately marked content which due to legal restrictions must not be changed. We accept guarantee for the rights of third parties only in case of compliant handling. 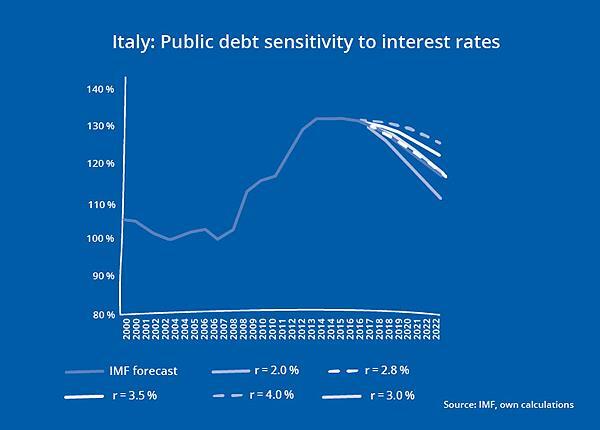 Italy’s debt sustains a large interest rate shock as long as the budget is kept under control. Debt sustainability depends on fiscal discipline and continued primary fiscal surpluses. Public debt is predominantly held by residents; primarily by financial institutions and the central bank. where D_t is the debt to GDP ratio, r_t is the average annual nominal interest rate paid on government debt, g_t is the nominal GDP growth rate and 〖PB〗_t is the primary general government balance in year t.
If we assume for a moment that the primary budget (fiscal revenue minus expenditure) is balanced, as long as the nominal GDP growth rate will equal the average nominal interest rate on government debt in the future, the debt to GDP ratio will be held constant at its current level. If the nominal interest rate is higher than the nominal GDP growth rate, debt/GDP is set to rise. The IMF projects 1.0 % real GDP growth on average until 2023 declining gradually from 1.5 % in 2018 to 0.8 % in 2021 and onward. The GDP deflator assumes annual changes in prices of goods and services averaging 1.4 % during the projection period. Since 2000, the primary fiscal balance of the general government averaged 1.5 % until 2017 (ranging between -1.0 % in 2009 and plus 4.5 % in 2000). In all but two years (2009 and 2010) total government revenue outsized expenditure (excluding interest cost). In the IMF’s forecast (World Economic Outlook), the primary surplus is projected to rise over time from 1.7 % in 2017 to 3.6 % in 2023. Average interest expenses have been declining to an all-time low in Italy. In 2017, average interest cost – calculated as the difference between the general government deficit and the primary deficit as a percentage of outstanding debt – was 2.8 % decreasing steadily from a peak in 1991/92 at more than 10 %. Assuming the IMF’s forecasts for nominal GDP growth and the primary budget balance (as described above), if the average debt servicing costs remains constantly at 2.8 % per year, then the government debt will decrease to 116.1 % of GDP until 2023 (Figure 1 - see PDF). It can be seen that this scenario (r = 2.8 %, grey dashed line) is very similar to the IMF’s own forecast (dark blue line) for debt/GDP until 2023. All else equal, if the average debt refinancing cost will be higher than the interest cost of maturing debt, then the total average debt servicing cost will rise above 2.8 % and the debt trajectory will become higher. The average debt servicing cost (coupon) of maturing bonds in the rest of 2018 is 3.1 % (Figure 2 - see PDF). If the government would refinance at exactly that rate, the total debt servicing cost would remain constant at 2.8 % (debt/GDP is shown by the grey dashed line in Figure 1), all else equal. If the refinancing rate would be higher than the coupon on maturing debt, than the debt trajectory would be higher. As can be seen, the debt/GDP trajectory for average debt servicing cost of 4 % would still imply a gradual decline until 2023 (dark blue dotted line). In addition to debt sustainability, the structure of debt by holding sector can be crucial for financial stability. The structure of Italy’s public debt has changed quite significantly. As figure 3 shows, the share of foreign holdings of Italian government debt securities declined during the Euro Area crisis from 50 % in early 2010 to 36 % in 2013 and has stayed constant since then. Italian financial institutions compensated for the declining importance of non-residents, increasing their exposure to the Italian sovereign. At a later stage the Banca d’Italia increased its government bond holdings in line with the ECB’s public sector purchase program (PSPP). Within the PSPP 341.2 bn EUR of Italian debt securities have been bought between March 2015 and April 2018 (Source: ECB). On the other hand, government debt is less diversified which makes domestic financial institutions particularly exposed to sovereign risk. Overall, it can be concluded that Italy’s public debt to GDP is not likely to further increase based on higher refinancing costs. However, this is conditional on fiscal discipline and continued primary fiscal surpluses in the years ahead. The IMF’s projection of primary fiscal surpluses is ambitious though necessary to significantly reduce the public debt to GDP ratio and revert the accelerated indebtedness following the global financial crisis. Data used for cross-country comparisons are based on the Bruegel dataset on sovereign bond holdings: Merler and Jean Pisani-Ferry, Who’s afraid of sovereign bonds, Bruegel Policy Contribution 2012|02, February 2012.. This publication is neither a marketing document nor a financial analysis. It merely contains information on general economic data. Despite thorough research and the use of reliable data sources, we cannot be held responsible for the completeness, correctness, currentness or accuracy of the data provided in this publication. Our analyses are based on public Information, which we consider to be reliable. However, we cannot provide a guarantee that the information is complete or accurate. We reserve the right to change our stated opinion at any time and without prior notice. The provided information in the present publication is not to be understood or used as a recommendation to purchase or sell a financial instrument or alternatively as an invitation to propose an offer. This publication should only be used for information purposes. It cannot replace a bespoke advisory service to an investor based on his / her individual circumstances such as risk appetite, knowledge and experience with financial instruments, investment targets and financial status. The present publication contains short-term market forecasts. Past performance is not a reliable indication for future performance. UNIQA Capital Markets GmbH is constituted as a limited liability company; the media owner is licenced as an investment firm and regulated by the Austrian Financial Market Authority (FMA-Finanzmarktaufsicht). UNIQA Insurance Group AG is 100% owner of UNIQA Capital Markets GmbH. Information on general economic data.